Homemade is the way to go! This easy recipe comes from a wonderful beginner's book on macrobiotics called The Hip Chick's Guide to Macrobiotics by Jessica Porter. 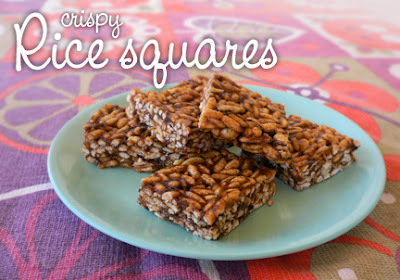 You can use regular Rice Crispies cereal but for a much healthier treat (which will be soft and chewy), used puffed whole grains from the health food store. Pictured here using puffed brown rice, almond butter, slivered almonds and carob chips. Over medium heat, liquify syrup, nut butter, and optional vinegar, vanilla, spices. Stir constantly until the mixture is smooth, homogenous and bubbling a little. Pour cereal into mixing bowl. Add rice syrup mixture to it and blend well with a stiff spatula, stirring in any dried fruits and/or nuts if using. Pour into an 9x10" oiled pan and flatten with a wet spatula (wet hands and press down into corners and to flatten nicely). Let cool, slice and serve! I'm just wondering about using honey for a sweetener in recipes that are baked. It seems you aren't supposed to heat honey? Is there a reason other than it losing nutritional value being heated? You are right, as I often mention Ayurveda does not recommend heating honey (ie. cooking with it or baking with it, not even adding to hot beverages) because it makes it rajasic and destroys its vitality and health benefits. It's okay to warm it up slightly, but for heated recipes it's better to use agave nectar or brown rice syrup.